Briefly: Andrew Niccol’s In Time, starring Justin Timberlake and Amanda Seyfried, is a week away from hitting theaters and in anticipation of its release you can win tickets to its premiere in LA tomorrow simply by tweeting. All you have to do is log onto twitter and #intimepremiere to see a virtual map with the location of the ticket giveaways. Five people located in the Los Angeles area are secretly handing out pairs of tickets to the event. As the amount of tweets increase,the closer you’ll be to discovering the secret giveaway locations… until time runs out. . . The more you tweet the more the virtual map zooms in on the locations of the five people who are handing out these tickets. Be one of the first on the scene and say the passphrase “Every second counts” to claim your tickets to the LA premiere on Thursday, October 20th. Visit www.intimemovie.com to begin the race! 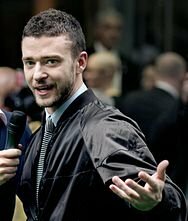 Grading a Decade of Justin Timberlake Movies. He Got MORE SOPHISTICATED as years went by. And so, it seems, did CASINOS!